QDP has leveraged its rich history of thin foil stamping for the hard disk drive (HDD) industry to provide similar services across the electronics industry at large. In particular, stamping of thin foil shielding materials is in growing demand. It is critical that precision specifications be consistently satisfied as the major push in the electronics industry is to develop higher performance in a smaller footprint. These demands influence impact component manufacturers who are tasked with producing parts that ultimately satisfy the overall product feasibility. Achieving improved performance often requires faster internal processors which tends to put more strain on existing components. Unanticipated side effects often arise as a result of these greater stresses. Furthermore, many OEM electronics manufacturers will seek ways to implement multi-functional components to retain the demands for a smaller product footprint. This forces component manufacturers to meet tighter specifications which requires them to modify their own manufacturing processes to satisfy demand. Ideally, OEMs will seek out suppliers who can not only meet their specification demands, but also partner with companies like QDP who are willing to actually help them troubleshoot and define the right specifications. Examples of multi-functional components in electronics are the shielding materials used for electrostatic discharge (ESD) shielding, electromagnetic (EMI) shielding, radio frequency (RF) shielding, or any other shielding of unwanted disruptions. These materials are found in almost all electronic devices to maintain proper functionality, but most OEMs would choose not to have to factor them into their design if it was possible to avoid having to do so. Thin, adhesive backed foils manufactured by 3M are commonly used as shielding materials because of their size and credibility. But consistently stamping high volume components that meet precision specifications can be extremely difficult to fabricate. QDP has extensive experience in high volume stamping of thin foils for almost any electronics application. Our familiarity in working with 3M thin foil adhesives allows us to anticipate potential design inefficiencies that may arise during the manufacturing process. We partner with our customers to not only identify these issues, but help to resolve them in a variety of ways, such as recommending a different material, modifying design specifications, or even coming up with alternatives that allow for multi-functionality. We have even been in situations where factors such as packaging and assembly were not factored into the equation and we provided our expertise to identify and satisfy those demands as well. 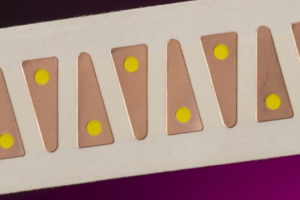 Are you in need of precision thin foil stampings? Contact us today to discuss how QDP can solve your problem and provide you with the quality you demand.